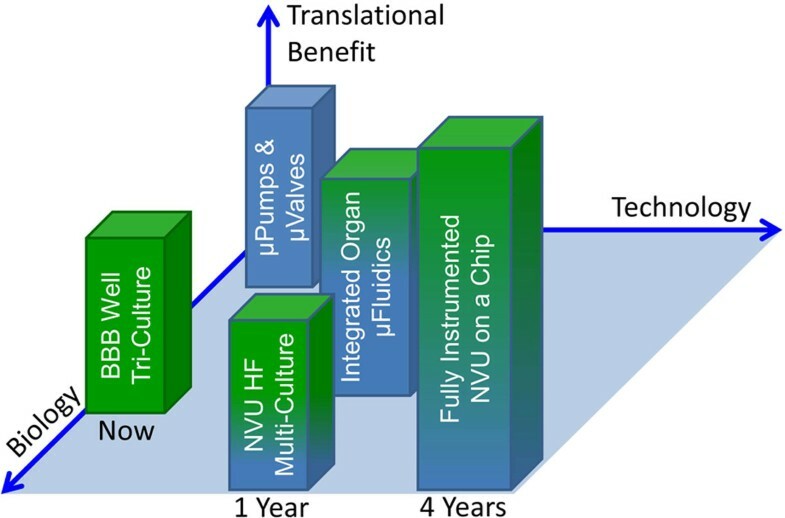 There is growing interest in the use of organs-on-chips or human vascular constructs [1–4] to mimic human physiology in a variety of clinical studies, including 'the assessment of drug or biologic candidate efficacy and toxicity' that has been cited by the National Institutes of Health (NIH) as a critical need for developing in vitro microphysiological systems . In particular, the development of drugs for treating disorders of the brain is severely limited by the lack of such systems to evaluate penetration of drugs into the brain . Despite the physiological and pharmacological importance of the highly controlled chemical signaling between the systemic vascular system and the brain, there are only limited reports of the organ-on-a-chip approach being applied to the blood-brain barrier (BBB) [7–10]. Physical or pharmacological disruption of chemical signals between the systemic blood flow and the brain impairs normal functioning and responsiveness of the brain. Long-range chemical signaling through dysregulation of cytokines, nutrients, growth factors, hormones, lipids, neurotransmitters, drugs, and their metabolites is also important, but these chemical signals are difficult to quantify and cells are typically studied in isolation. Hence there is a need for platforms that enable monitoring of complex intercellular communications. Recapitulating in vitro the physiological characteristics of brain vascular segments represents a critical issue. Adequate modeling of the cerebrovasculature could significantly help our understanding of the mechanisms and improve the pharmacology of diseases where the neurovascular interface is disrupted or pathologically altered. Moreover, the existing concern related to the use of animals (especially primates) has created additional pressure for a satisfactory in vitro BBB model. As part of the NIH Microtissue Initiative, we are developing an in vitro, three-dimensional, multicompartment, organotypic neurovascular unit that includes a central nervous system (CNS) compartment coupled to a realistic BBB and blood-cerebral spinal fluid (CSF) barrier, circulating immune cells, and a CSF compartment (Figure 1). The neurovascular unit will ultimately be used with a recently developed multimodal analytical platform to examine the role of the BBB and the blood-CSF barrier in modulating chemical body-brain interactions and to characterize the interactions of astrocytes, pericytes, microglia, and neuronal and endothelial cells in the brain and its barriers. The unit will also assess the effect of a wide range of drugs, chemicals, and xenobiotics on the brain. The current and predicted clinical use of this model rests on its versatility to accommodate cells from patients with known pathologies who are (or are not) exposed to a drug treatment. The clinical viability of the BBB model upon which our approach is based has been demonstrated in rigorous comparison studies against human brain in situ . Similarly, the micro-fabrication technology utilized in this device has proven robust for the study of neuron-neuron and neuron-glia interactions . Microphysiological model of the neurovascular unit that supports blood, brain, and cerebral spinal fluid compartments. The system, under development by Vanderbilt University, Meharry Medical College, and the Cleveland Clinic Foundation, utilizes two rectangular, microfabricated compartments representing the brain and the cerebral spinal fluid (CSF) that are separated by a planar ependymal layer that forms the brain-CSF barrier. The upper chamber contains the neurons (purple and blue) and an artificial, hollow fiber (HF) capillary that carries blood to the brain surrounded by the cells that make up the blood-brain barrier (BBB). Endothelial cells line the luminal surface of the HF, and astrocytes (pink) and pericytes (green) cover the abluminal surface. The lower chamber is filled with CSF and contains a small HF that serves as an artificial choroid plexus (red) that produces CSF, and a larger HF venule (blue) that carries blood away from the brain and controls entry of immune cells into the CSF. Each HF, with inner diameters ranging from 200 to 600 μm, is lined with endothelial cells and surrounded by the appropriate cells for choroid plexus and venule function. The lower compartment thereby supports a collection of cells that form the blood-CSF and CSF-brain barriers. Collectively, all the cells will reproduce the neurovascular microenvironment found in the brain. Leukocytes can circulate in the blood-surrogate medium. Microdialysis fibers (not shown) in each compartment will enable near-real-time monitoring of metabolites and signaling molecules. The geometry is suitable for massive parallelization as required for high-content screening, and for daisy-chaining different brain regions to allow the study, for example, of chemical communication in the developing brain. Our research should offer new and unbiased views of the correlations among the diverse chemical signals of the brain, enabled by a combination of state-of-the-art microfluidic devices, polymeric biomaterials, pump and valve systems, cell culture and organotypic human brain-cell preparations, analytical instruments such as on-chip miniature electrochemical sensors and off-chip ion mobility-mass spectrometers, computational bioinfor-matics techniques, and control theory that is needed to regulate the coupled organ systems [4, 13]. The BBB comprises the interface between peripheral circulation and the CNS. As we have reviewed previously , the BBB not only supplies nutrients to the CNS and removes waste products, but also prevents blood-borne pathogens and toxic products from harming the brain. The molecular integrity of the BBB is the result of a network of tight junctions (TJs) between individual capillary endothelial cells that lack fenestration and have a reduced capacity for pinocytosis. The TJs of the capillary endothelium are supported by astrocyte end feet and pericytes. CNS pericytes are vital to BBB development  and function (they enhance TJ barrier function, stimulate expression of TJ proteins, and reduce permeability of the capillary endothelium to molecules passing between the cells [16, 17]), and thus are a crucial element of the BBB model [18–20]. Most BBB in vitro culture models, however, include only brain microvascular endothelial cells (BMVECs) and astrocytes in a static Transwell culture. While the Transwell BBB system has been widely used owing to its simplicity, it does not provide the shear force critical for proper endothelial polarization and TJ formation , which result in both an endothelial permeability that is higher than physiological permeability and the absence of BBB-specific phenotypic characteristics . Most important, current BMVEC/astrocyte models of the BBB do not take into account the close physical association of pericytes to the brain capillary endothelium . The addition of intraluminal flow in a hollow fiber BBB model and the presence of astrocytes on the abluminal surface lead to physiologically realistic polarization of the endothelial cells and strengthen the TJs [11, 24], which is a significant improvement over a static preparation. Flow-based microfluidic devices that co-culture endothelial and stromal cells produce an endothelium with physiologically appropriate polarization [11, 25–27], but a well-studied and proven approach using hollow fibers does not allow visualization of the intraluminal cells [11, 21]. Similarly, cell lines have been widely adapted to the Transwell model but, again, the results were far from being of translational relevance [22, 28]. Many investigators have long recognized the limitations of immortalized cell lines or nonhuman cells and moved away from their use in favor of primary human cell cultures [11, 22, 28, 29]. Our project under the NIH Microtissue Initiative seeks to address these short-comings (Figure 2). Benefit of translating various components of the neurovascular unit on a chip to pharmaceutical industry/clinic. The initial work represents largely uncoupled biological development (green shading) of well-plate triculture of endothelial cells, pericytes, and astrocytes and technological development (blue) of microfluidic micropumps and microvalves. Later, these technologies enable hollow fiber (HF) multiculture bioreactors that also include neurons and microglia. The integrated organ microfluidics technologies support studies with platforms containing relevant cell populations. Each of these four components has immediate translational potential to science, industry, and national security. Ultimately, the biology and technology are totally merged to create a fully instrumented neurovascular unit (NVU) suitable for translation to industry and medicine. The near-term and ultimate biological and technological returns from the development of a fully instrumented human NVU on a chip should improve our understanding of the physiology of the blood-brain interactions and the development and assessment of the safety and toxicity of both new central nervous system (CNS) drugs and systemic drugs that might affect the CNS. As a result, the approach outlined here could contribute to the diagnosis, treatment, and even prevention of traumatic brain injury, obesity, aging and neurodevelopmental abnormalities, cancer, stroke, epilepsy, Alzheimer's disease, schizophrenia, Parkinson's disease, HIV-associated neurocognitive disorders, neurotropic viruses and parasites, and drug addiction. A low-cost NVU model could be useful in studies of brain tissue regeneration, drug interference toxicity screening, personalized medicine, neural regenerative medicine, and brain-tissue stem-cell technologies. The lack of an effective in vitro BBB model has a negative impact on pharmaceutical research and development, and subsequently affects the primary care of patients. At the cellular level, the BBB comprises BMVECs with TJs lining the brain microvessel, together with the closely associated astrocyte end-feet processes, where BMVECs are responsible for the transport of xenobiotics, nutrients, hormones, and metabolites from the blood into the brain, and vice versa. The need for improved BBB models is even more apparent given the now-recognized role that pericytes play in the BBB, particularly in infections such as human cytomegalovirus . In addition, poor BBB penetration is responsible for the failure of several potentially useful CNS drugs to reach the market. Another important but often neglected issue in neuropharmacology is that proper function of the BBB enables the use of a broad spectrum of systemically active drugs that would be otherwise neurotoxic. This becomes clinically relevant since many diseases of the brain are associated with a leaky BBB, and patients may be administered therapeutics that exert unanticipated harmful CNS effects (for example, use of antibiotics in advanced meningitis). Finally, the BBB provides a shield for exogenous neurotoxins spanning from nerve agents to psychotropic drugs, and hence a physiologically realistic BBB can be useful. Disturbances to the BBB have profound implications in traumatic brain injury, a topic of urgent interest to athletic organizations  and the military, yet are hard to study in vivo. An effective in vitro BBB/CNS/CSF model such as we are working to develop must have a small fluid volume (lest the paracrine and metabolomic signals be diluted below physiological effect), require a limited number of human cells because of their cost and rarity, recreate interactions between different brain regions, allow visualization of cells on both sides of the BBB, and be coupled in real time to advanced electrochemical and mass spectrometry instrumentation that can detect the important chemical signals . The model's clinical utility would rest on its ability to recreate unique regions by selecting specific combinations of neurons, endothelial cells, astrocytes, other neuroglia, pericytes, and leukocytes. This model would use cells and fluids derived from patients with known pathologies to assess drug treatments and physiological stress from chronic diseases such as obesity, and acute injury such as stroke; would uncover potential adverse effects during drug discovery and phase 1 clinical trials, such as toxic transformation of approved drugs by brain endothelial cells; would detect novel and unbiased correlations between large numbers of chemical signals that converge at the BBB; and, finally, would combine microfluidic devices, pumps and valves, state-of-the-art cell culture, and organotypic human brain-cell preparations, analytical instruments, bioinformatics, control theory, and neuroscience drug discovery. The utilization of cells from individuals of different ethnic backgrounds would allow a mechanistic approach to understanding health disparities associated with drug metabolism that can often greatly influence clinical outcomes. We are taking an integrated approach to the development of a detailed, in vitro model of the human neurovascular unit that should provide technologies applicable to clinical research that could reveal new mechanistic and region-specific insights into how the brain receives, metabolizes, and is otherwise affected by drugs, neurotropic agents, disease, and pathogens that traffic the BBB. We intend our platform to be implemented using primary human cells from normal or disease states obtained either commercially or from surgical resections; however, the ultimate contribution of in vitro microphysiological systems depends on the ability of either embryonic or induced pluripotent stem cells to provide the diversity of cell types required to support the widespread adoption of such human-like physiological models. Finally, our system is being designed to be linked to other organ-on-chip systems supported by the NIH Microtissue Initiative. Research reported in this publication was supported in part by the National Center for Advancing Translational Sciences of the NIH under Award No. UH2TR000491, NIH Awards No. MH093903 and No. R21CA126728, and pilot grants from the Meharry Clinical and Translational Research Center (NIH Award No. U54RR026140), the Defense Threat Reduction Agency under Grants HDTRA1-09-1-00-13 and DTRA100271 A-5196, the Defense Advanced Research Projects Agency under Grant W911NF-12-2-0036, and a Vanderbilt University Interdisciplinary Discovery Grant. The content is solely the responsibility of the authors and does not necessarily represent the official views of the funding agencies and organizations. The authors thank Damir Janigro, Nicola Marchi, and Chaitali Ghosh for numerous conversations about the BBB. They thank Dominic Doyle for his help in preparing Figure 1, and Allison Price for her editorial assistance. The cost of publication of this manuscript was funded by the National Center for Advancing Translational Sciences of the NIH under Award No. UH2TR000491.